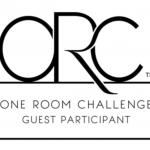 Welcome back to another fabulous week of the One Room Challenge. 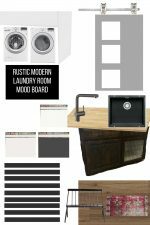 We have decided to take on our laundry room and make it over in 6 weeks…yikes! You can check out the before pictures and the inspiration board in the post from week 1. When making over a space, one of the biggest challenges, I think, is where to start. With so many ideas swirling around in your head, it can feel very overwhelming. You might not do anything because it seems like so much. Who’s with me? For me, it has always been helpful to start at the floor…sometimes if I am really on my game I will paint first… But usually it’s the floors. There are drop cloths for painting! The floor anchors the entire space and I can get a better sense of what I want it to feel like when I can see the floor. Then I can move forward with the rest of the design. 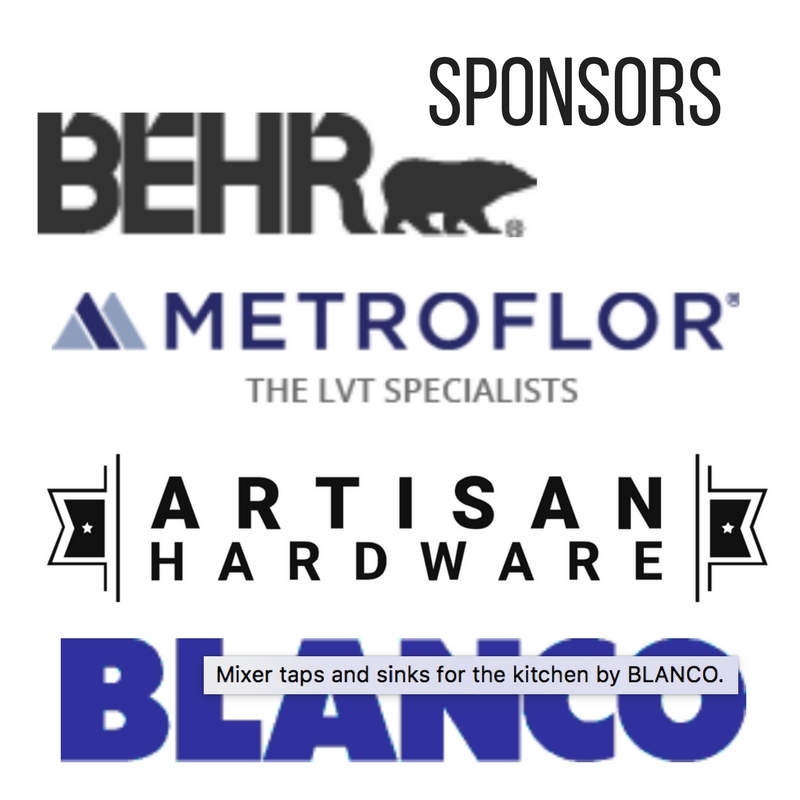 This post is in collaboration with Metroflor. My opinion of easy to install flooring that is so pretty and makes my life better is my own. See my disclosure for more info. 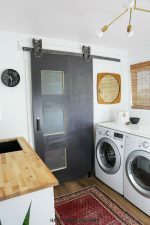 -The laundry room is an addition…before we moved in. -Tile was out because it would have raised the height of the floor higher than our kitchen floor where it transitioned. -And the noise…the floor sounds like you are in the middle of an old western walking through a couple of swinging saloon doors…so bad.. and so hollow sounding due to the addition only having footers and no solid foundation. -Plus, the floor is not level. -And….the sheet vinyl had been ripped, so parts of it are missing. A big ol’ pile of yucky floors. When taking these items into consideration, we decided that LVT flooring would be the best choice. 1- What is LVT flooring? LVT stands for Luxury Vinyl Tile….but it comes in all different styles. There is LVT that looks like tile, wood planks, and stone. It can be installed over a variety of surfaces. Currently there are two different types of LVT. There is a type that clicks together, like a puzzle (what we did) and another type that uses adhesive to glue to the floor. 3- What does it feel like? As with any product there are premium options and basic options. Most LVT that I have seen does have texture. If you want texture and the feel of real wood, for example, be sure to look at some samples and see if it meets your standards. This line from Metroflor is waterproof. You will need to make sure what you are purchasing is waterproof. 5- What is the wear layer? LVT is made up of many different layers of material. The wear layer is toward the top of the flooring. It’s made out of a clear vinyl. This is the area that protects against scratches and abrasions. A wear layer of 8 is not as good as a wear layer of 20. The higher you go the better the protection. This is very important. 6- What is the warranty? Check with the manufacturer to see if there is any warranty protection. 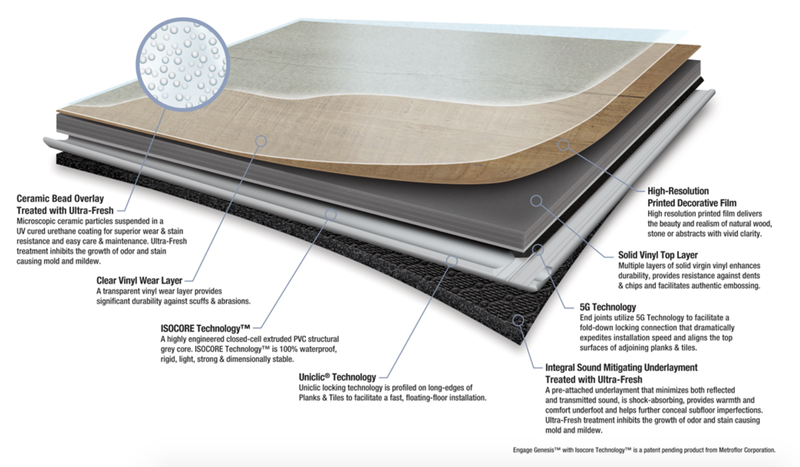 -If you are concerned with moisture in your subfloor, check the moisture of the subfloor and fix any issues before installation. -The subfloor must be flat, within 1/8th inch on a 6 foot radius. You can use a self leveling product to fix any areas. Luckily, our floor was within these guidelines so we did not need to do any floor leveling. -LVT can be laid over a variety of surfaces, including tile. 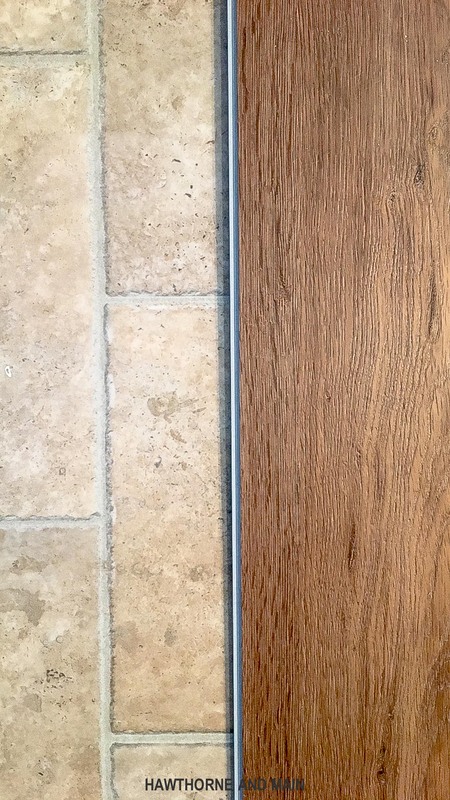 You DO NOT need to fill the grout lines in your existing tile with leveling compound if this is going in a home with tile floors. -Old adhesives from carpet or other sheet vinyl products need to be removed or skim coated. 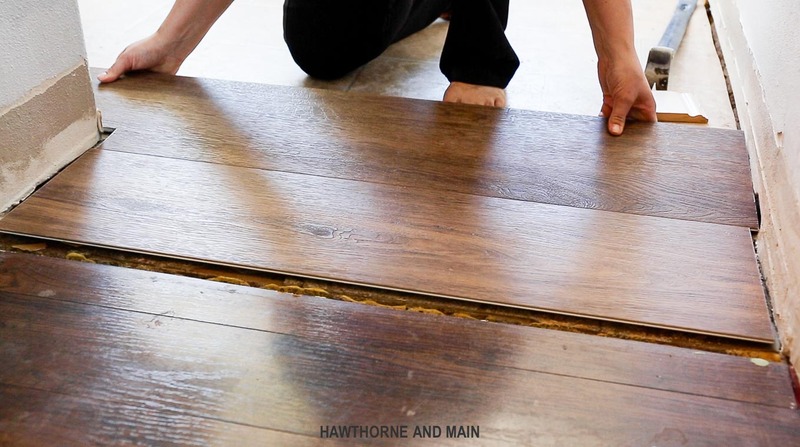 Make sure there are no ridges or marks left on the floor. 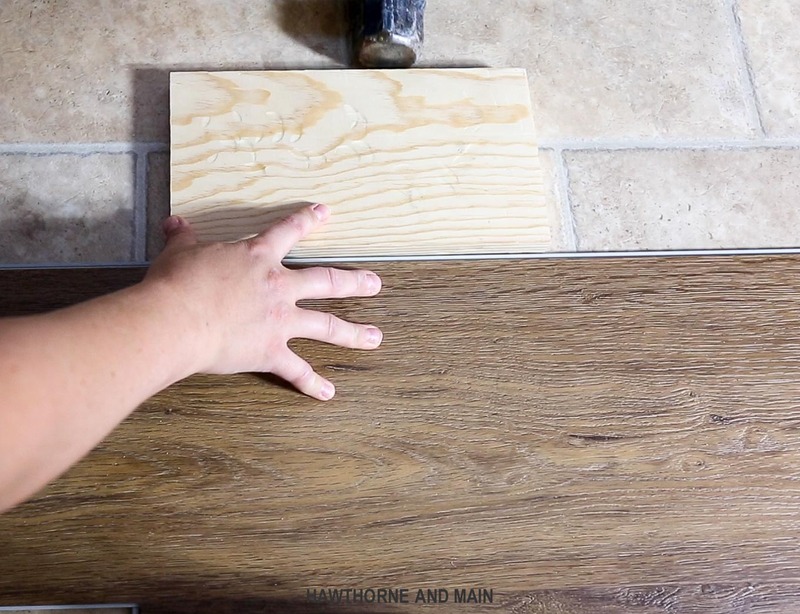 -Letting your new LVT flooring acclimate is not required but I feel like it doesn’t hurt. Be sure to only stack boxes three high. -We used a jig saw and scroll saw to cut all pieces of LVT for this job. For straight edges, you can score with a utility knife and snap it to break it. -Turn on your HVAC at least one week before installation. The temperature in your home needs to be between 65-85 degrees for 48 hours before installation. 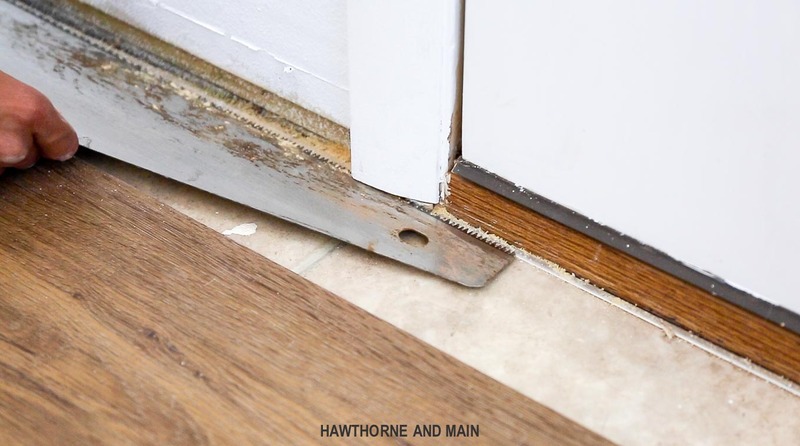 -In order to get the new floor to fit under the door casings, you must use a saw to cut away the bottom of the casing. Clean the subfloor thoroughly before laying the flooring. -Determine your starting wall. Installation will move from left to right. Add spacers to the wall or some small scrap pieces of wood. This will ensure you have the desired spacing and to allow the floor to expand and contract. -Determine where you will install your first plank. -Next, install the first plank on the second row and tap into place. We used a scrap board and a hammer to snug up each board. 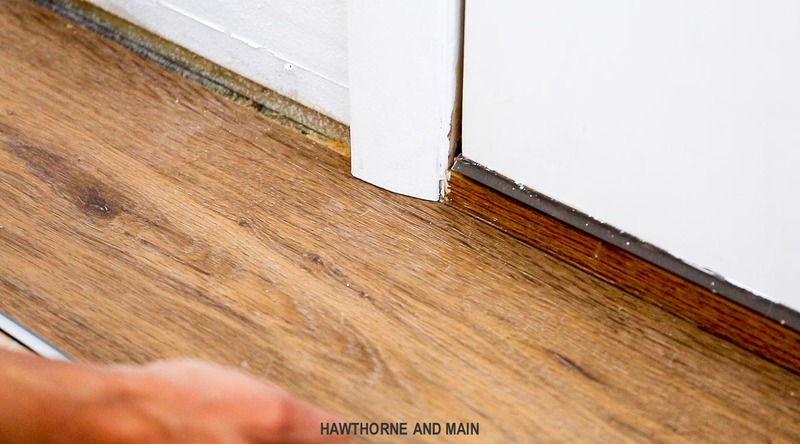 Be careful because the board can damage the edge of the LVT if you hammer too hard. -Stagger the planks in a random pattern. The stagger should be a minimume of 6 inches. -Next, install the second plank on the second row and then finish with installing the second plank on the first row. -Repeat until you reach the end of the wall. -Measure, mark and cut the last plank. -Once the wall is complete, remove the spacers and add trim. Be sure not to pin down the floor with nails. -In high moisture areas you can add 100% silicone caulk to the expansion areas, just in case. We decided to go with Metroflor Engage Genesis 2000XL line with the color Palmetto…it is so so pretty. The Engage Genesis line has a solid core called ISCORE. It is made up of different materials to create an outstanding product. We love the black acoustic underlayment that comes with the flooring...it has gotten rid of the old western stomping noise, yay! Seriously…that feature was what sold me!! I was worried that the seams where each plank clicked together would peek. I can honestly say, the floor is totally flat, and there is no peaking or ridges. The floor has beautiful texture! It looks like real wood, and I love the low gloss look. If you are in the market for new flooring, I cannot recommend LVT enough! Metroflor is the leading specialist in LVT flooring. Have you ever considered LVT flooring? 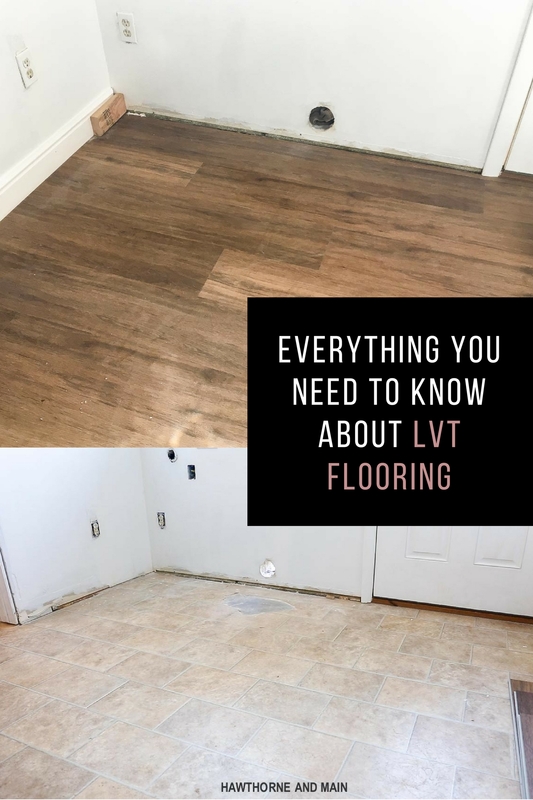 Do you have more questions about LVT? Let’s start a discussion in the comments! A big ol’ THANK YOU to our fabulous ORC sponsors! 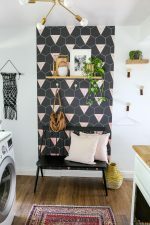 These great tips work for me also I installed the peel and stick kind in our guest bathroom and will be installing it again in our master bathroom for this ORC and I love how simple and affordable vinyl is. We love our LVT! This looks amazing! Can’t wait to see the final reveal – so excited to be doing this ORC with you!